I live in a small two bedroom home with my husband, daughter and two Rottweilers. Although I am superbly grateful I own a home at all, it can be quite challenging fitting everything we would like into such a small space. My husband and I once used the second bedroom as our office/craft room, however with the arrival of our baby, it has now become her nursery. When I first designed her nursery, I implemented my craft space into it. This seemed like it would be a good idea, but instead I found it to be quite intrusive on her play space. My husband and I racked our brains looking for a way to make her nursery all hers. He suggested we make use of the front entryway, which is about the size of a large closet and was pretty much a wasted space. We moved my craft area into the front entry and soon realized that I was left with the major task of fitting a rooms worth of stuff into a closet sized area. Because of this, I was forced to come up with some strategic organizing solutions, one of which I want to share with you. I am a craft hoarder. I think this stems from me not being able to choose just ONE craft outlet but instead wanting to partake in them all (ie painting, scrapbooking, drawing, sculpting, sewing, etc) With this crazy craft hoarding of mine I often accumulate large quantities of useful items when I see them on sale. Ribbon is one of these items. It is very useful in a number of the crafts I like to do, but is quite a nightmare to store, especially when I am so limited in space. I found that most ribbon boxes and racks were not only very expensive, but didn’t fit very many spools, took up a lot of wall or shelf space and didn’t allow me to hang my large spools as well as my smaller sized ones. 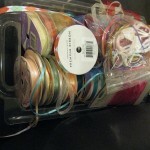 In comes my saving grace…Advantus Cropper Hopper Ribbon cards and ribbon clips. These are three inch plastic cards that you can wind your ribbon around and then store in a small box or drawer. They saved me so much space! I went from a jumbled mess of tangled ribbons that I never used because it was so inconvenient, to a well organized small box of all my ribbon that was easily accessible. Take a look at my before and after pictures. It really has made a huge difference in my ribbon usage! The cards come in two sizes (1″x 3″ and 3″ x 3″) in packs of ten, while the clips come in packs of 25. I liked the cards so much that I looked into alternative ways to also store my fabric and found that they have something very similar for fabric yards. 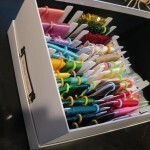 When I have the funds I plan on ordering some Fabric Storage Cards in the future. I am on my way to a clean and usable craft space! I love cropper Hopper! They have the best organizing stuff ever. I love this solution too! Great work!